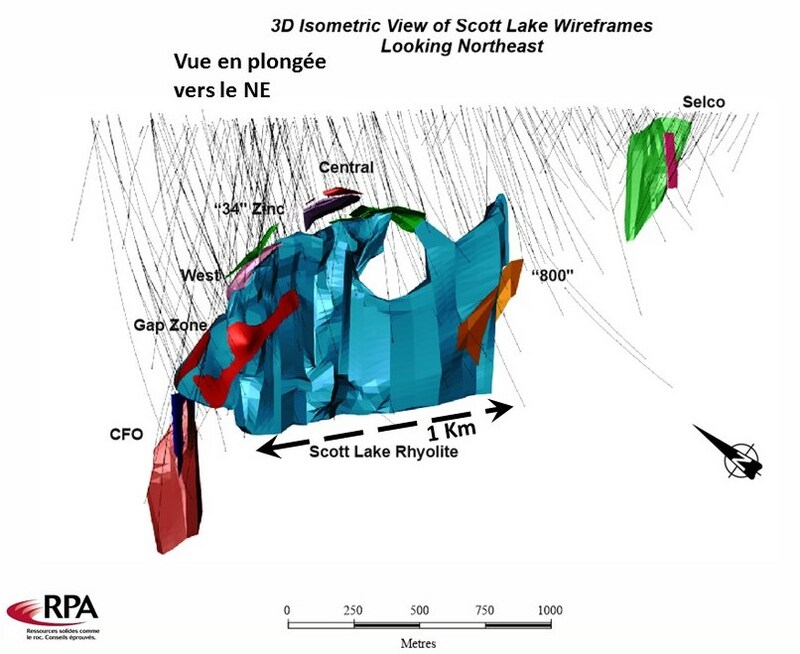 The Scott Lake project is located in the Chibougamau area approximately 20 km west of the town of Chibougamau. The property includes three (3) distinct blocks: the Ouje Claims, the Thundermin block and the Scott-Diagold block. All of the blocks are 100% owned by Yorbeau but may be subject to underlying royalty agreements. 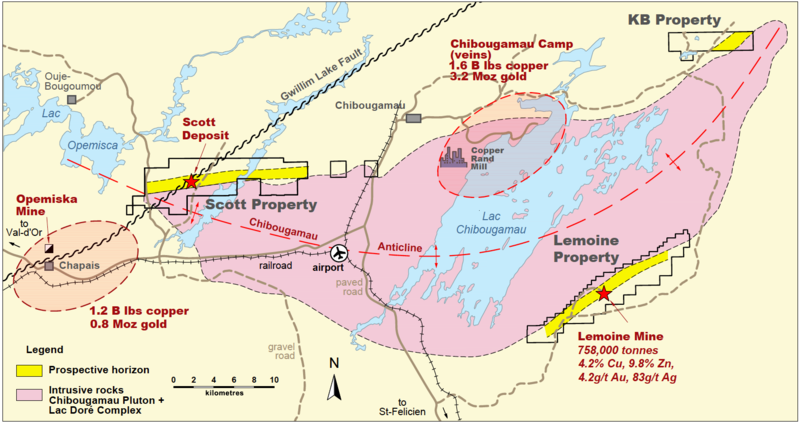 The property is located on the north limb of the Chibougamau Anticline and covers 18 kilometres of strike length of felsic rocks of the Waconichi Formation. On the south limb of the Anticline, the Waconichi hosts the past producing high grade Lemoine mine which is now part of the Company's Lemoine project. The project has seen considerable exploration activity in the mid 70's and in the late 80's following the discovery by Selco of a small VMS deposit. During the late 80’s, two additional massive sulphide lenses were discovered by Thundermin (Central and West Lenses). Since 2006, Cogitore discovered four new massive sulphide lenses (“800 Lens”, “CFO Lens”, “34 Zinc zone” and “SC-30 Lens”) and added considerably to the Central and West Lenses and to associated stringer sulphide envelopes. In 2015 Yorbeau discovered the new “Gap Lens” which was drilled until late 2016. 1. CIM definitions of Mineral Resources were applied. 2. Resources are reported with NSR cut-offs of C$100/t for massive sulphide lenses, and C$65/t for stringer zones. Additional details are available in a Technical Report prepared by Bill Roscoe (RPA) in 2017. With updated resources of nearly 18 Million tonnes, a preliminary Economic Assessment was completed by RPA in late 2017. Under the base case PEA the Scott mineralized material is fed to a new 2,500 tonne-per-day concentrator plant located at the mine site. Results indicate positive economics with net revenues of nearly $2 billion, a pre-production capital expenditure of $215 million, a net pre-tax cash flow of $519 million, an Internal Rate of Return (“IRR”) of 16.6%, a pre-tax Net Present Value (“NPV”) of $146 million at an 8% discount rate, and a mine life of 15 years. Tables 1, 2 and 3 show summaries of LOM estimated project. The Scott Project would take approximately two to three years of initial development to prepare the mine for production. Mining during the LOM will include 50% mineralized material from Longitudinal LH stopes, 26% from Transverse LH stopes, 11% from Cut and Fill stopes, and 13% from development. The Stringer type mineralization will be mined using the Longitudinal stoping method and thus represents a large portion of the production profile. A concentrator would have to be built on site and the mill production mirrors the mine production. The mill feed would produce copper and zinc concentrates assumed to be commercially viable. 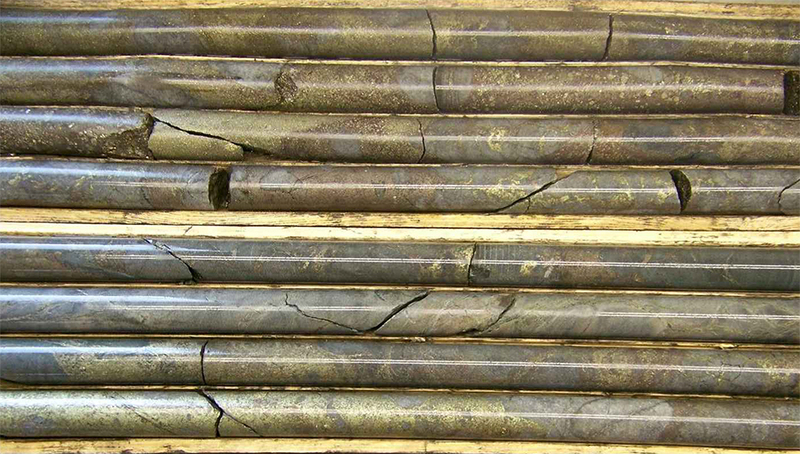 Mill recoveries for the concentrates based on early metallurgical test work are 87% for zinc and 85% for copper. Precious metal recoveries in the copper concentrate are respectively 45% for silver and 63% for gold. Estimated mill recoveries for the concentrates are based on early metallurgical test work, and additional testing of the massive sulphide mineralization and the stringer mineralization independent of each other are required to adequately fully understand the metallurgical response during processing of both types of mineralized material for the life of the mine and to obtain marketable concentrate products. 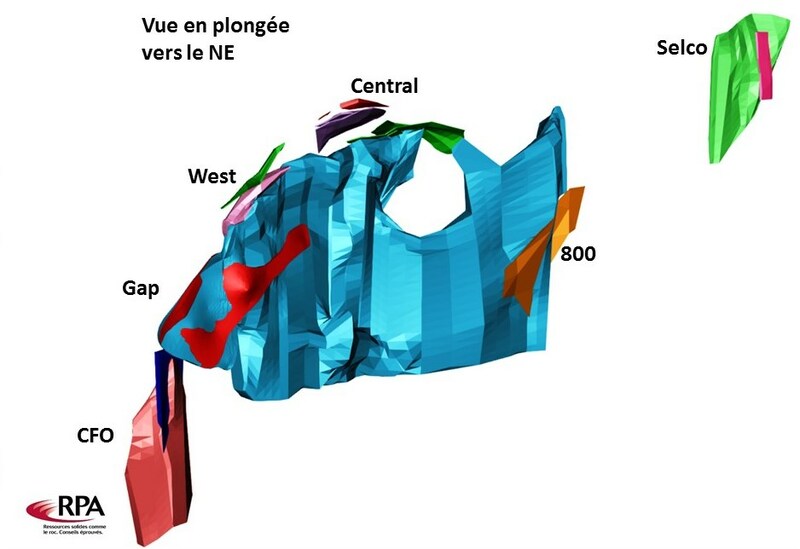 Yorbeau Management believes that the results of the PEA study provide a strong, initial foundation for eventual development of a new mine in the Chibougamau camp. The ideal location of the project in a region already blessed with all necessary infrastructure has led to maintaining estimates of infrastructure capital costs to a very low level when compared to similar zinc projects. The horizontal widths and favorable geometry of the mineralized zones support the use of low cost long hole mining methods which had a big positive impact on the results of the study. 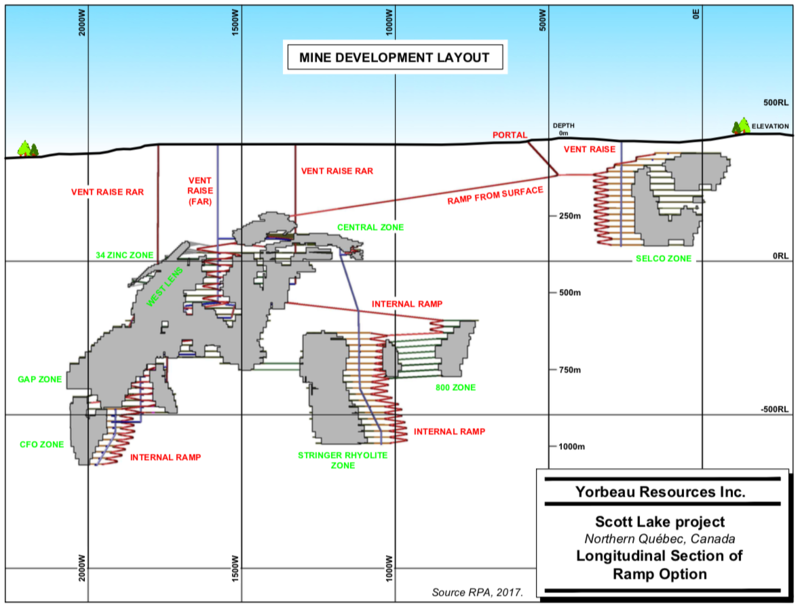 Yorbeau is now in a position to evaluate a number of options to develop the Scott deposit.